Bells Island is one of two populated "island" communities that are found in the Currituck Sound. Small but easy to access and explore, the island is a good side-trip for visitors who want to uncover every corner of Currituck County. 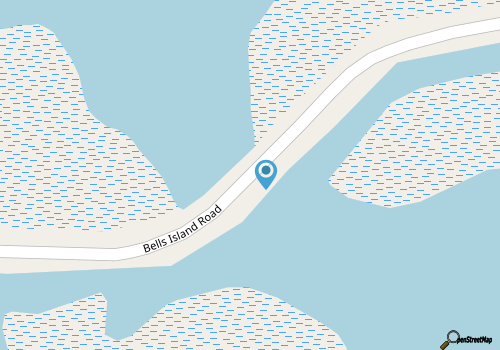 Bells Island is located in the town of Currituck and is easy to access from US 168 via Bells Island Road. It takes just 7-8 minutes and 3.5 miles of driving to cover the length of the island from the Currituck mainland, making it an easy off-the-beaten path destination. The island was originally home to a remote community that was sustained by individual farming, hunting and fishing. Today, while hunting and fishing are still recreational past-times, the community is popular with Chesapeake area communities and other full-time residents. There are about 75-100 residences on Bells Island, but no grocery stores, gas stations, restaurants or other amenities. (This is not a huge inconvenience considering that the center of Currituck is literally about 3-4 miles away.) Many of the properties are soundfront or Canalfront, with easy access to the Currituck Sound. The big (and only) attraction on the island is the Bells Island campground. Located at the very southern tip of the island, the campground is a popular destination for Currituck County visitors who want to be close to the water in a secluded, and relatively quiet community. The campground is situated on approximately 22 acres of land that is adjacent to the Currituck Sound. Bells Island is one of the oldest campgrounds in Currituck County and first opened to visitors in 1963. The campground is located 5 minutes away from the Knotts Island ferry, and is a 20 minute boat ride away from the beach community of Corolla. It's also a 45 minute drive away from the Outer Banks beaches. Area restaurants within a 10-minute drive include the Pass the Salt Cafe, McDonalds, Currituck BBQ Company, and the roadside Morris Farm Market for fresh produce. Bells Island Campground features 39 full hook-up RV sites, 24 RV sites with water and electricity, and a separated collection of 26 tent areas. Campground amenities at Bells Island include a dump station, restrooms, and shower facilities for campers. Community amenities include tennis courts, horseshoe pits, basketball and volleyball areas, and a boat ramp and fishing pier. Popular activities in the campground include fishing, crabbing, boating, swimming, sailing, and jet skiing. Pets are allowed but must be leased at all times. Rates vary depending on the type of site available, as well as the season. The campground is open year-round and visitors can all (252) 267-2284 for current rates. Off the Wall Tap House brings a fresh blend of technology, community, and great food to the Outer Banks. Our restaurant, located in Corolla, provides an interactive dining experience that is memorable and fun. Our innovative beer wall allows you to personalize your experience and try over 20 craft beers. Taste test just an ounce, fill a pint, or choose anything in between. Our beer wall caters to every beer connoisseur’s tastes. We have IPAs, lagers, porters, and more! Choose your favorite and enjoy it while watching one of our Direct TV sports packages. Not into beer? Have a drink from our wine and cocktail menu! Have a seat at a table or enjoy the fresh Outer Banks air on our outdoor patio. Make new friends at our high-top communal tables or bring your whole group. Refill your drink when you want it. Test out several beers before you commit to a pint. Try something new. The beer wall experience is completely customizable and unlike anything else in the Outer Banks!